Is this the Phillies 2019 Opening Day lineup? UPDATE: Gabe Kapler confirmed on WIP on Wednesday that this will indeed be the Phillies' Opening Day lineup. On Monday, just a few days before they're set to open the season against the Braves, the Phillies submitted their final lineup of 2019 Spring Training, and it perhaps gives us a glimpse of what Gabe Kapler's lineup will look like on Thursday at Citizens Bank Park. First, the one minor surprise here is that Andrew McCutchen and not Cesar Hernandez will lead things off for the Phillies this season. Hernandez, who had spent the last few season atop the order, has been bumped down to the seven-hole in favor of the veteran outfielder. When we did our season preview, we speculated that Hernandez would make a return to the top of the order, but it appears, at least for now, that McCutchen will get the nod — after all, he's spent the majority of time in the leadoff role this spring. As for the rest of the lineup, it's more or less what was expected, with Jean Segura, Bryce Harper, Rhys Hoskins, and J.T. Realmuto making up the heart of the Phillies order, with Odubel Herrera, Hernandez and Maikel Franco rounding out the order. Of course, some of this could change on a day-to-day basis, as we saw last season that Kapler is not afraid to tweak his lineup order based on the opponent. The only player remaining in the same spot from the year before, aside from starting pitcher Aaron Nola, is Rhys Hoskins. And perhaps the best news to come out of all this, however, is the fact that Hoskins is healthy. The power-hitting first baseman missed the last few games with a shoulder injury, but a return to the Grapefruit League finale should put to rest any fears that Hoskins would be ready for the start of the season. 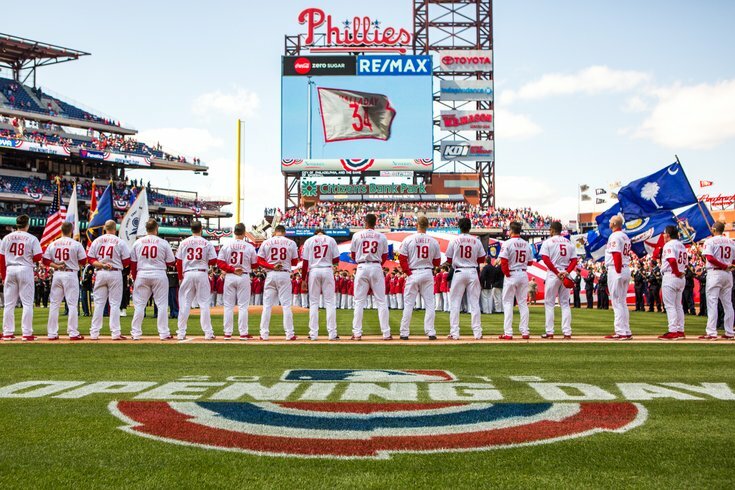 The Phillies 2019 campaign will begin against the Braves on Thursday at 3:05 p.m. at Citizens Bank Park.